Drapers - Laurie & McConnal Ltd. 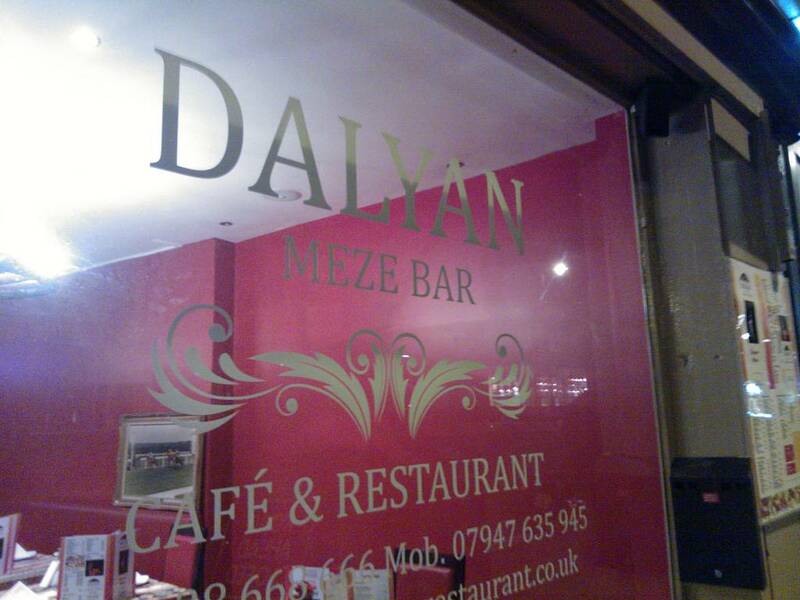 In February 2015 both No.30 High Street and the restaurant in Crown Walk became the Dalyan Meze Bar, a Turkish café & restaurant. 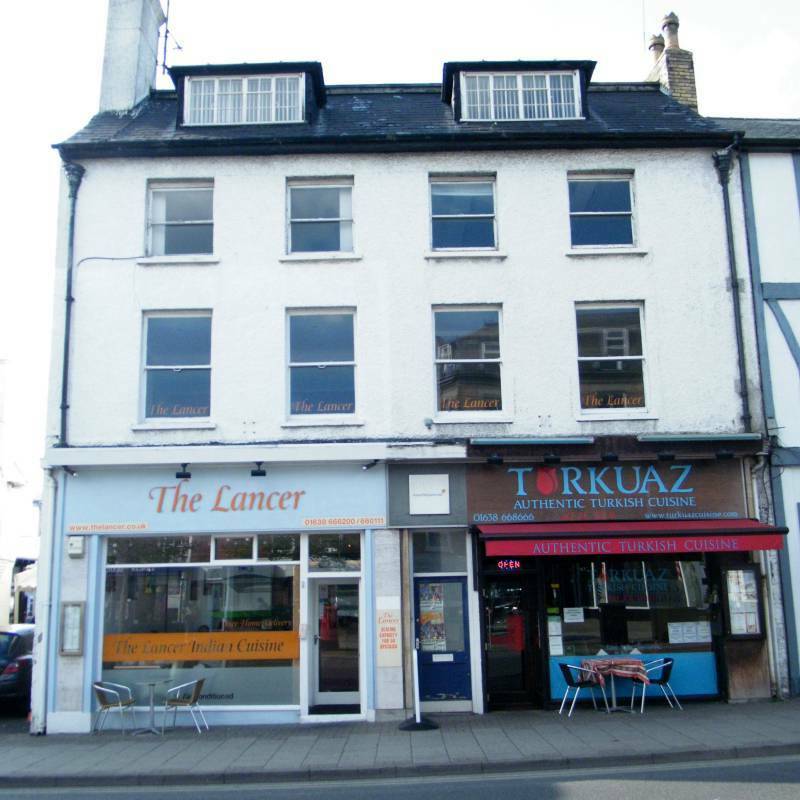 In February 2014 the Turkuaz Restaurant moved around the corner into No. 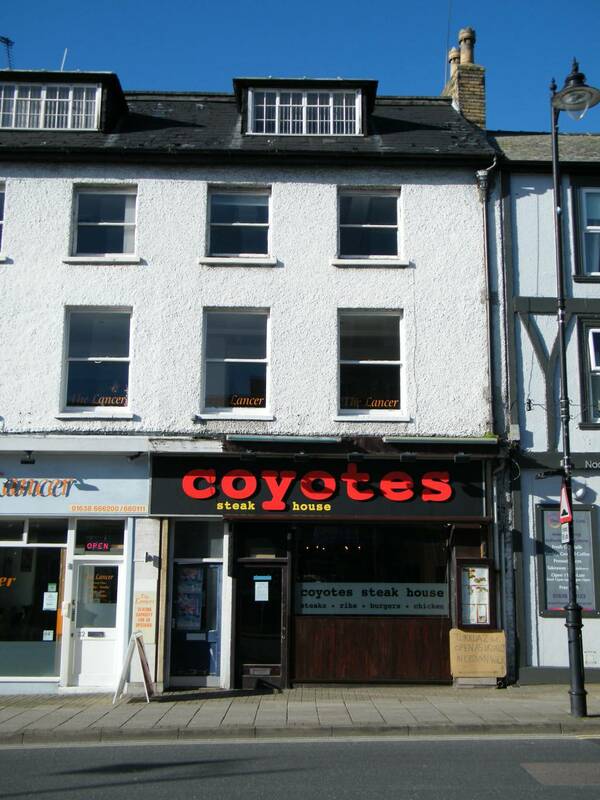 4-5 Crown Walk and a new restaurant, Coyotes Steak House, opened in the right-hand part of Mentmore House - No. 30. 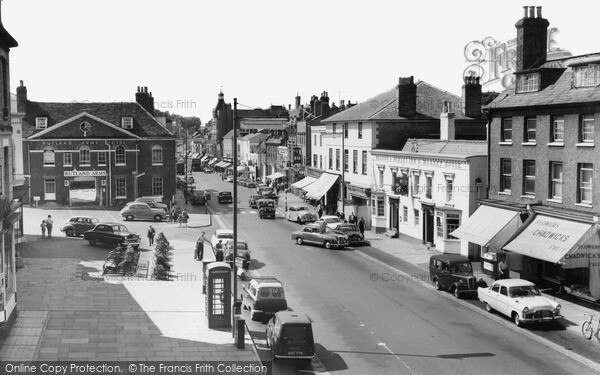 John Frederick DRACKETT-CASE (1844-1915), originally from Lowestoft, moved with his wife Alice and his 9 children to live in Newmarket, starting his business at The International Tea Stores at No.76 High Street. On the 1891 & 1911 censuses he's shown as a fishmonger. By the 1901 census his son Frederick Charles had married and moved out to live in St. Philips Road, before finally moving to Mentmore House (No.30 High Street) by the 1911 census. His other son Percival Ernest also married and moved to St. Philips Road by 1901, finally moving to live next door to his brother in the other half of Mentmore House (No.32 High Street) by the 1911 census. 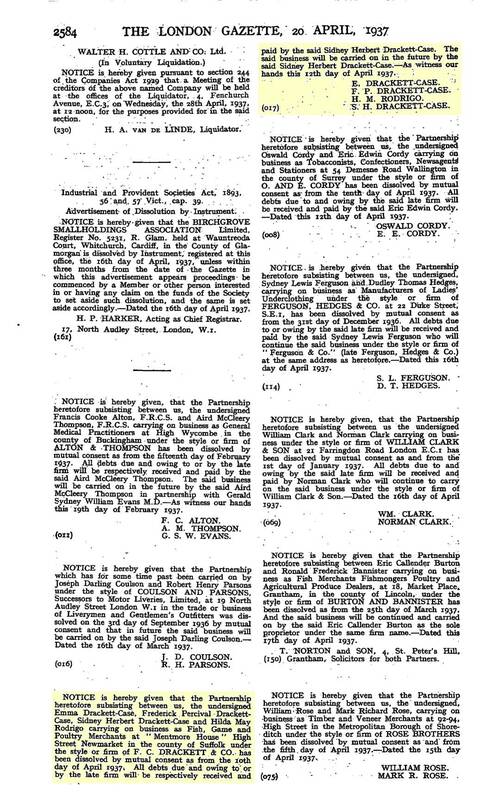 London Gazette 20th April 1937 p.2584 - dissolution of F.C. Drackett & Co., fish, game and poultry merchants - business carried on by Sidney Herbert Drackett-Case. Physician and Surgeon, shown on the 1901 census - he's later listed in the 1909 Phone Book at Kingston House and then in 1910 in Rutland House - No.42 High Street. 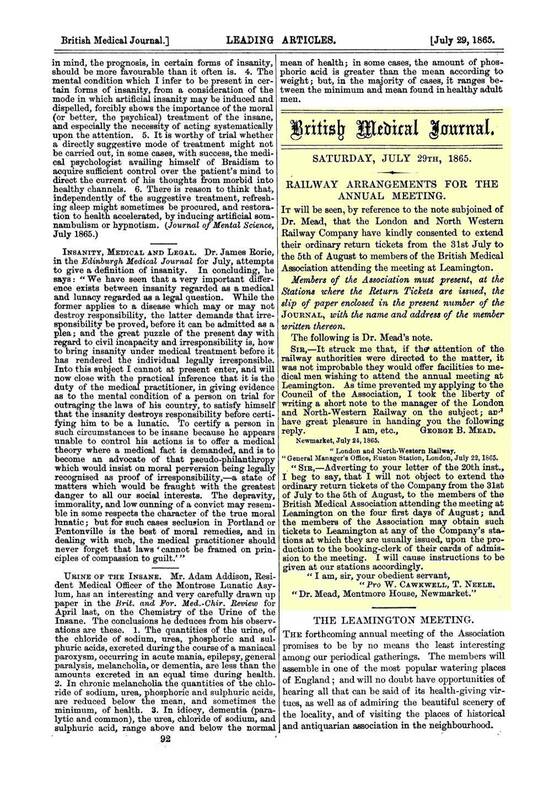 The British Medical Journal 9th April 1870 p.379 - Mentmore House - Geo. B. Mead, M.D., L.R.C.P.Lond. Mead, George Borwick, M.A., M.D., Ph.D., Mentmore House, Newmarket. British and Foreign Lepidoptera. 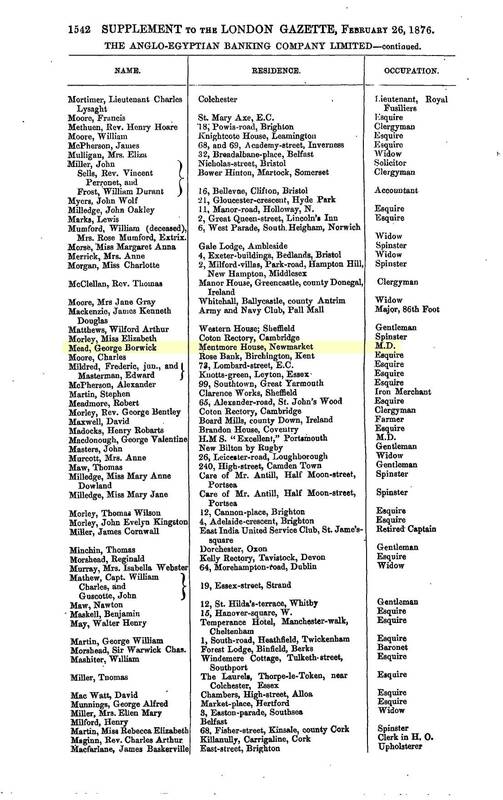 George Borwick Mead was in the Medical Directories from 1860 at Mentmore House. Prior to this his address is not given, but it's known he was in partnership with Frederick Page in Newmarket in 1857 and until 1st May 1858 (see below), so it's likely he was in Mentmore House from that time. Frederick Page, Surgeon is listed in Robson's Commercial Directory of Beds, Bucks ..., 1839 - no address given. 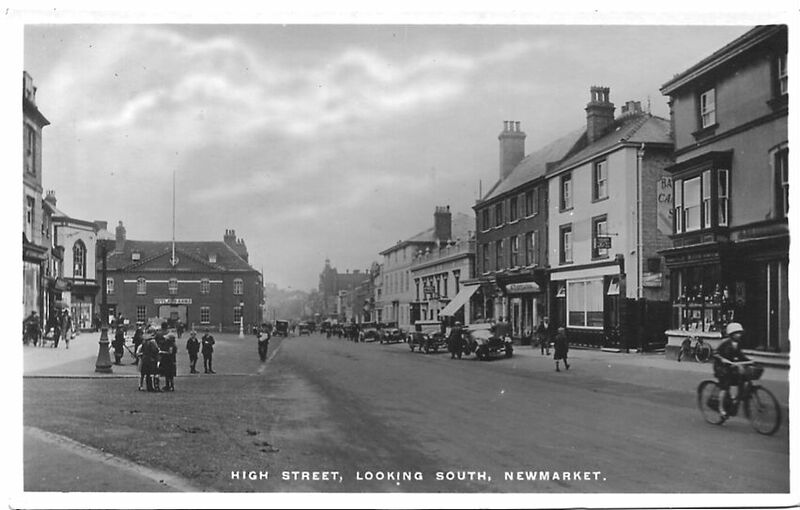 On the 1841 census Page's residence was further up the High Street, on the St Mary's side and we don't know where he lived in 1851 as the St. Mary's census for Newmarket is missing and he doesn't give an address in the Medical Directories. 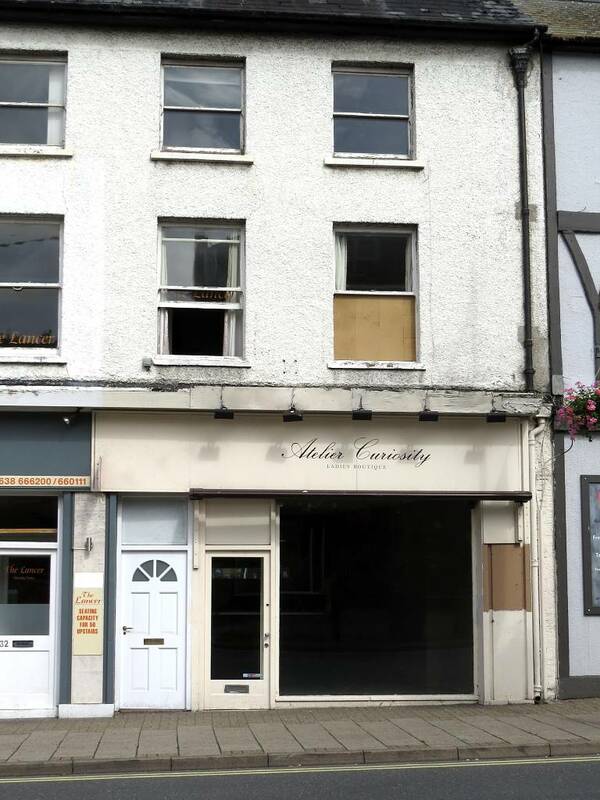 After dissolution of the partnership Page moved away from Newmarket. 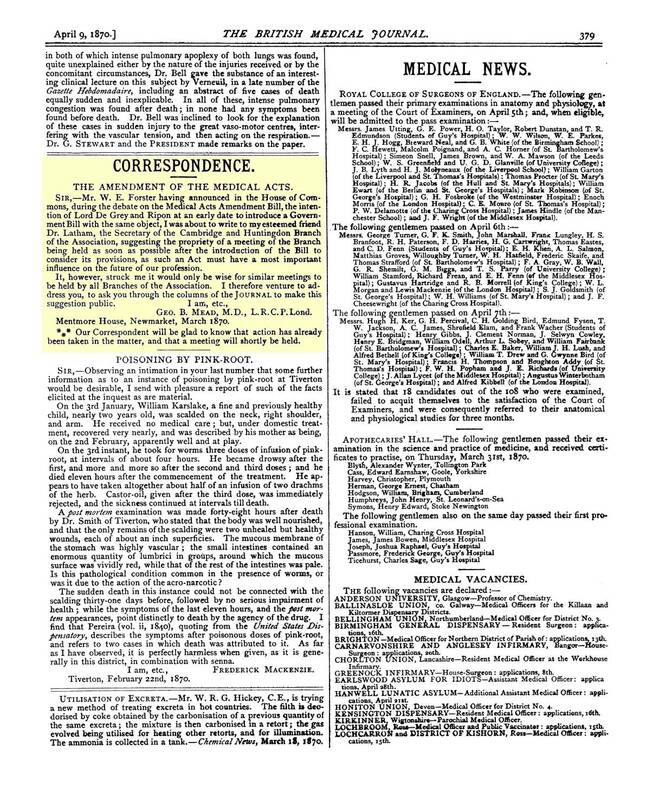 PARTNERSHIP heretofore subsisting between us, the undersigned FREDERICK PAGE and GEORGE BORWICK MEAD, in the profession, practice, and business of a Surgeon, Apothecary, and Accoucheur, at Newmarket, in the counties of Suffolk and Cambridge , and elsewhere, under the style or firm of Page and Mead, was DISSOLVED, by mutual, consent, on the first day of May instant. George Borwick Mead is mentioned in the Medical Directories up until 1897, and his son, George Borwick Owen Mead is listed from 1880 until his early death in 1900. 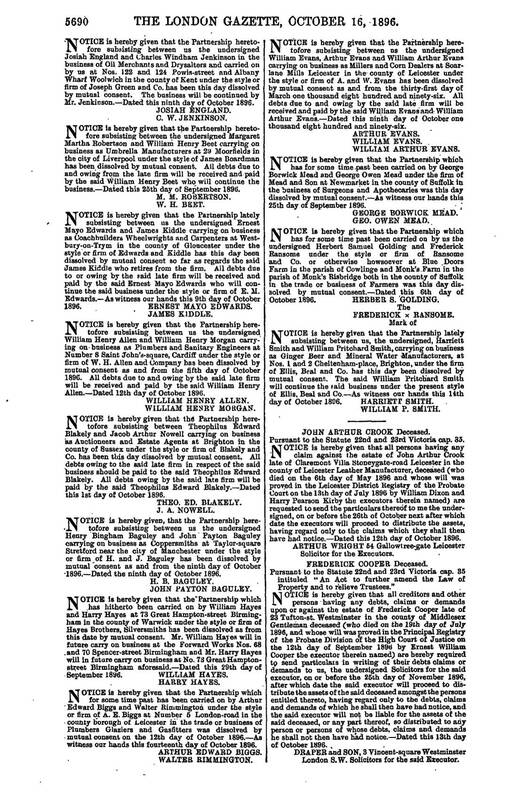 The father and son partnership was dissolved on 25th September 1896 - see London Gazette article below. George Borwick Mead was born 21st Apr 1831 in Ramsey to Joseph and Jane, baptised on 25th Apr 1831 in Huntingdon Wesleyan Chapel. He married Elizabeth Owen in 1856 in Ely, so presumably moved to Newmarket soon after. George Percy Mead, born 23rd August 1866, although it has to be noted that he was initially registered as Percy George Mead, changing his name later to George Percy. He doesn't seem to have had anything to do with the Newmarket medical practise, in 1891 he was in Coleshill, Buckinghamshire and in 1911 in Bicton, Shropshire - listed as a 'Gentleman', with 'Private Means'. On the 1891 census George Owen Mead is in Mentmore House with his sisters Georgina and Georgette, but their father George Borwick Mead is shown as a widower, living on his own in Royal Avenue, Chelsea - working as a General Medical Practitioner. Robert James Peck can be seen on the 1841 census between The Crown and Waggon & Horses, so presumably Mentmore House - he died in 1848 and his practice was continued by his son Floyd in Cardigan Lodge - No.113 High Street, who emigrated to Australia in 1858. Sarah, Robert's widow probably continued living in Mentmore House until just before Floyds emigration, when she moved to be near family in Folkestone. She might well have sold the house to George Mead in 1857, who was a partner of Frederick Page and not associated with the Peck's practice. 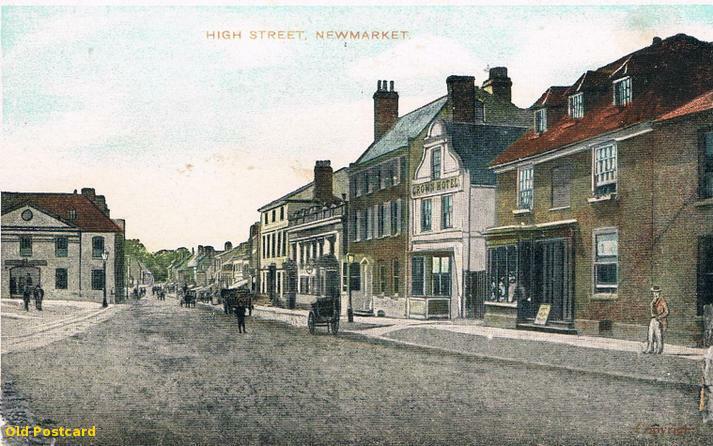 The earliest evidence of Robert Peck's practice in Newmarket was 1815 (mentioned in the Society of Apothecaries historical records of 1820 as having been in the town 5 years earlier, his actual address is not given). 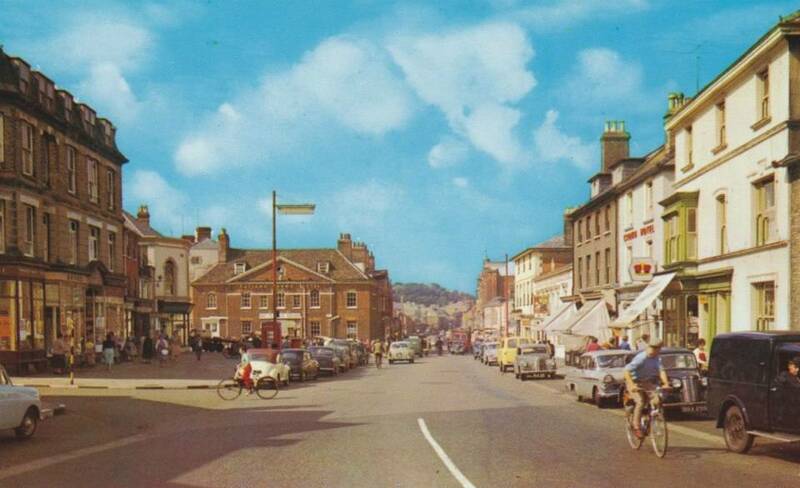 Floyd's practice in Cardigan Lodge was taken over by William Henry Day, who subsequently moved to Lushington House on The Terrace in 1862, where the practice continued for the next 64 years until Alton House was built next door. 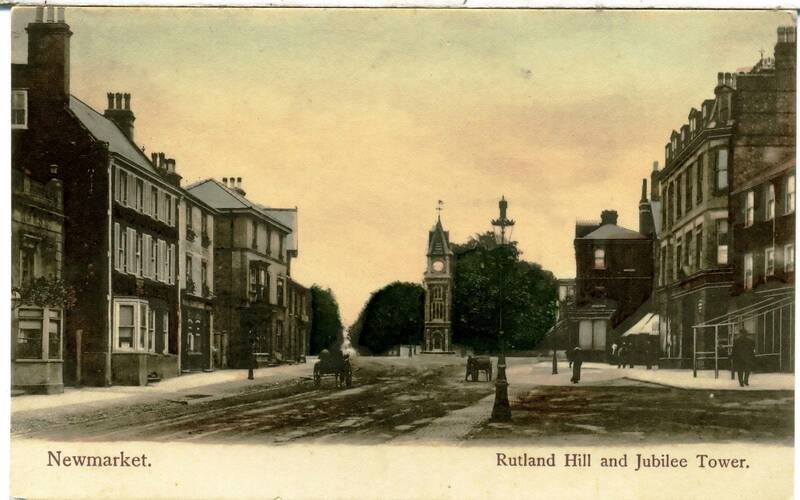 Many thanks to Roger Newman for the postcards 'High St West c. 1930' and 'Rutland Hill and Jubilee Tower c. 1905'. 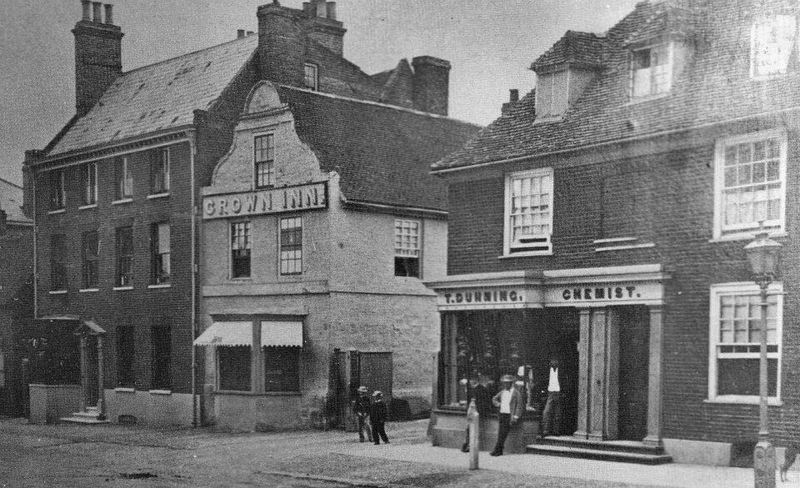 Many thanks to Tony Pringle for his photo 'Crown Inn c.1900'. 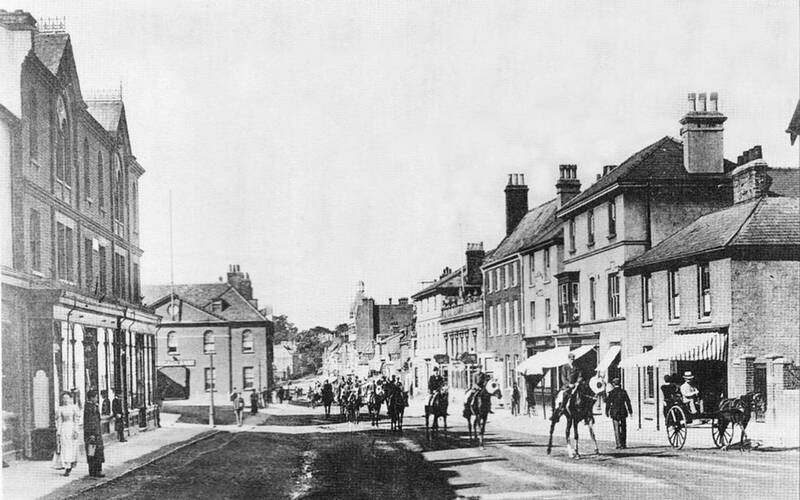 & 'Clock Tower end of High Street c. 1890s'.